Number One Owen Turtenwald may have won Grand Prix Houston (with his Rally the Ancestors variant) but the hot new deck in Standard has to be Hardened Scales! 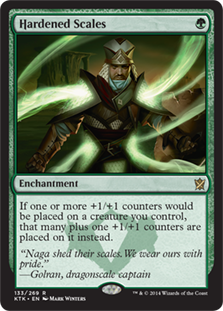 The new version of Hardened Scales takes advantage of Nissa, Voice of Zendikar as a source of +1/+1 counters. Faster than Undergrowth Champion (as Undergrowth Champion is essentially a four drop), the newest Nissa synergizes with namesake Hardened Scales itself, buffs any and all creatures on your side… And even gives the Rally deck fits. I mean, once you start ticking up Nissa’s [+1] what is the Rally player supposed to do? Their creatures are relatively dorky, so they might have problems getting through the seemingly innocuous 0/1 Plant tokens (believe it or not). They can’t let this go on for very long before, you know, Nissa just goes Ultimate!